TOP: "Liber Necris: The Book Of Death In the Old World"
The physical or mortal shell. The body. Corpse. Ego, reason, and abstract thought. The subconscious self and emotion. The conscious or ethical awareness. Also thought to be the freedom of choice. Life force itself; soul-fire or aethyric energy. The notion or idea of a particular individual. The shadow. Proof of mortality. And that prompted me to create a table of the undead components, which I haven't figured out how to port over to Blogger yet. 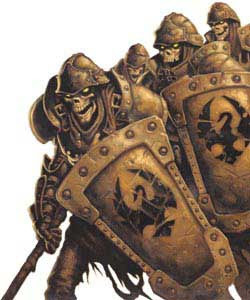 - Skeletal Ogre, Troll, etc. - Zombie Ogre, Troll, etc. Hope you enjoyed my convoluted thought patterns! Quick post today... may get in another later today. I'm still enjoying Trunk Monkey. The allure of seeing punks like car thieves, obnoxious kids, vandals, etc. ...get their come-up-ance from the Trunk Monkey is near undeniable. Quick secondary post today... I'm still really enjoying Trunk Monkey. Who could have known the Trunk Monkey had such financial acuity or such a vast repertoire of breakfast snacks knowledge? Maybe the Trunk Monkey is really Homer Simpson in a costume? I saw a great movie the other day ago... a real cliffhanger called "Vertical Limit." Great flick, I highly recommend it... go out and rent it. Don't expect witty dialogue or a particularly good storyline, but the special effects, good-looking "faces," great soundtrack, and amazing special effects are worth enjoying for their own sake separate of the cruddy plot line and dialogue. Unwind, eat popcorn, watch people fall off mountains. That's entertainment. When the characters just shut up and dangle, Vertical Limit becomes one heck of a wild time. 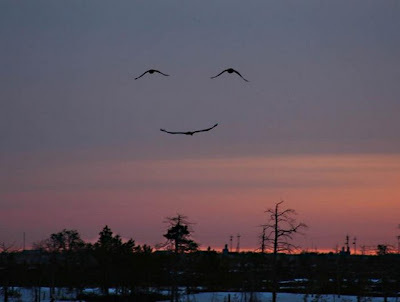 TOP: A smile in the sky! I love the stuff I get sent in the mail... I'm away at training so I don't have time for a longer post today, but I am working extensively on the 6mm to 10mm sci-fi rule sets preview for the mini game fans who read this blog. 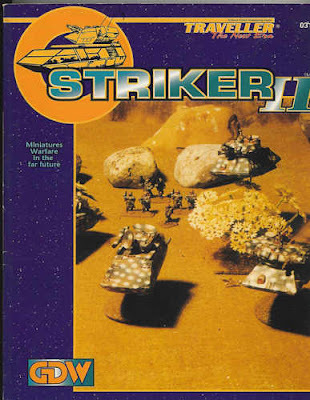 TOP: Striker II, one of the classic Traveller mini rulesets. Gamers are funny breed... they tend to get very obsessed with their particular gaming interest whether it be board games, miniatures games, RPGs or otherwise. They'll obsessively learn everything they can about their gaming niche interest and "collect"everything they can. And I wish I could say that I was different, but I'm NOT. I love my niches and collect everything I can related to them whether it be 6mm sci-fi, 10mm sci-fi, AIW, modern missile boats, my 28mm undead collection, or anything else that interests me. And 6mm sci-fi rulesets are one of my niches! ...that first laid claws into me. 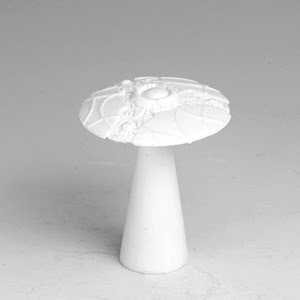 TOP: A lesser known 6mm sci-fi ruleset, Micro Sci-Fi. Gladiator Games came out with a great 6mm sci-fi miniatures line in the early 2000;s, but could never get out a rule set to accompany the line. In 2007, Gladiator Games sold the line to Baccus who developed a rule set for the game, which has since been available. Command Horizon (CH) is a battalion level sci-fi ground battle game designed to be quick-playing. If you do have advice or suggestions, please post them at the my blog in the comments section or at the 6mm Science Fiction War Games Yahoo Discussion E-group. I corrected a few typos and added a title or two to the list. "You got whooped by a giant Smurf, Dweezil!" I LOOOOVVVVEEE the Trunk Monkey! TOP: Some of the vast undead hordes of Maksimok the Mirthless! Well, I needed to prove that I'm still working on models so these two photos are getting some blog time. The both came from the 20 October 2007 MWS meet, and only one of from me, but they still show how much progress I've made on my 28mm undead army, the undead hordes of Master Necromancer Maksimok the Mirthless. I now have at least 2,000 points painted by WHFB standards, of undead that I can field as a Vampire Counts army. That's been my big project this year... and I've really been enjoying the heck out of it. 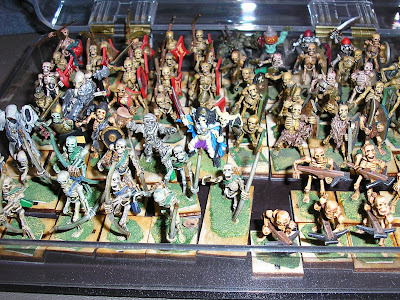 TOP: Joe painted this 10mm Warmaster Tomb Kings army. If you've never seen my buddy, Joe Riddle AKA Sukhmet's work, then you're really missing out. He's an incredibly talented miniatures artist. I'm a painter... he's an ARTISTE! 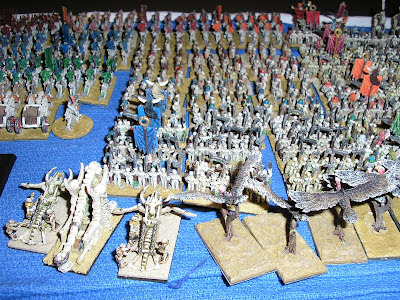 At any rate, one of Joe's latest triumphs has been this 10mm Warmaster Tomb Kings army that he's painted on commission. Joe's also a great guy to game with, except if you put him in charge of the zombies... he lets out a "Bwwwaaaaiiinnns" that's downright spooky... maybe creepy is a better word. The term viral video refers to video clip content which gains widespread popularity through the process of Internet sharing, typically through email or IM messages, blogs and other media sharing websites. In other words, viral videos are the chain letters of the computer generation... kind of like a video version of all those jokes we used to pass around by word of mouth. That being said, I LOOOOVVVVEEE the Trunk Monkey! And a Gut Shabbos to my Jewish readers! Another holiday has come, at least for Americans, so thank goodness for a day off on which to feast, get in a little hobby action, visit family, and be thankful for all of our blessing, of which I have many. I hope that you, all of my readers, do too! I'm not sure about all of you, but tomorrow, I'm definitely planning on getting some gaming in. My two nephews have finally reached an age where they want to join me in gaming and it was a hard slog to get them interested. I first introduced them to board gaming and they're now wanting to take the next step and try out miniatures war gaming. They've been watching me build my 28mm undead Vampire Counts army and want to join me. Vincent will be slowly building up an Orcs & Gobbos army while Quinn works on the Empire! I'm pretty excited to help get them going! TOP: "Hey look! It's a bird, its a plane, it's a..."
I've never felt that dressing dogs, or pets for that matter, was worth the effort. After all, pets already come dressed, why mess with nature? 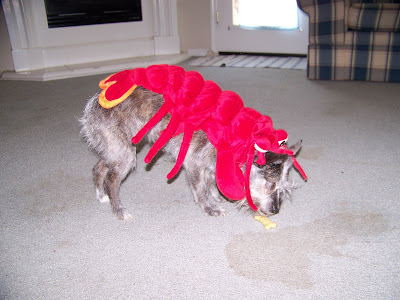 And very few pet costumes are really that snazzy anyhoo... And most just annoy the animal or get in the way until ol' Fluffy finds a way to tear the thing off. 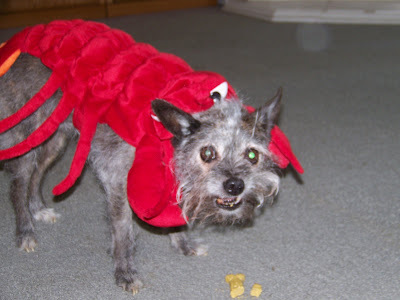 TOP: "The Dog-lobster goes for a biscuit." TOP: "Murphy, the dog, decides that costumes are OK..."
"...if they come with biscuits." 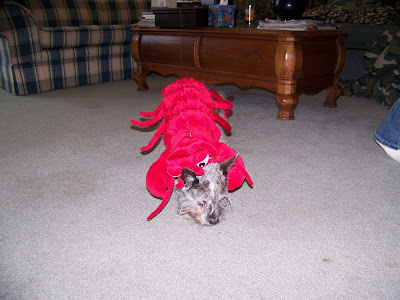 However, it only took Murphy one biscuit and a little begging to make "her" forget all about the "Lobster-dog" costume. Schadenfreude, indeed! TOP: "Hey Flo! Have you seen the dog?" TOP: "Hmmmm... Where could Sparky be?" 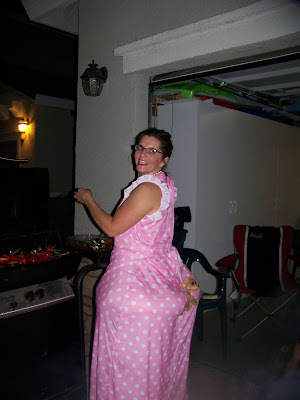 I have to give this woman kudos for wearing this costume... and allowing my friend to photograph her and then send me the photos. Woohoo! TOP: "Oh NO, Mr. Bill!" TOP: "Beam him up, Grozblorg! Get the probes ready..."
Just in case the photos didn't come through clearly, they are of a little guy getting beamed up by a UFO... Gotta love that! 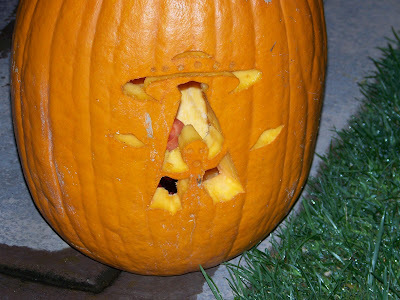 I think that the quality of pumpkin carving seems to go up every year... more and more folks are buying the pumpkin carving kits now available and really going to town! TOP: Chain Reaction 2.0, now FREE! Two Hour Wargames and all of their rule sets have become an icon in the gaming industry... relatively simply, fast-playing rules that play well. And, even better, they're pretty near universally liked. At least, I like them and nearly everyone I game with also has good things to say about them. CHAIN REACTION 2.0 FOR FREE?! What the...? But that's a new game ain't it? You're kidding, right? Yep it is and no we're not kidding. Then what am I missing and why is it free???!!! So to get you into the current THW system we decided to give it away. Because if you like it then you'll check out the others. No catch. We just want to provide gamers with a free sample of what Two Hour Wargames is currently about. What about figures, do we have to use yours? Heck no. In fact, with all rules from Two Hour Wargames you can use any figures that you want. Even those cool ones from that other set of rules that ended up in your closet. 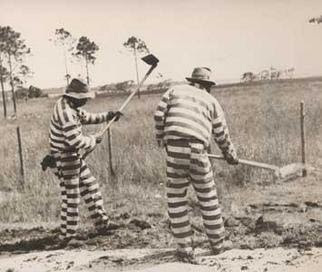 Just dig them out and put them to use. Well what if I like them and want to check out more Two Hour Wargames? Simple. Just download CR 2.0 and give it a try. Join the THW Yahoo Group by following the link and ask questions. Once you feel comfortable check out the rest of the THW site and see if anything is interesting. So what are you waiting for? Before we get on with the freebees, a reminder about the Two Hour Wargames Yahoo group! - If you have ANY questions about ANY Two Hour Wargames, including the freebies, then head to the group where you'll find around 2000 gamers, as well as the THW authors, ready to answer any questions you might have, no matter how silly they sound! One of the other things I can say about Ed Teixeira and the Two Hour Wargames (THW) online community is that they are an exceptionally friendly and helpful group. A friend recommended that I E-mail Ed awhile back when I was looking for advice on creating my own rule set and I did, to which Ed E-mailed me back and was exceptionally friendly and helpful. 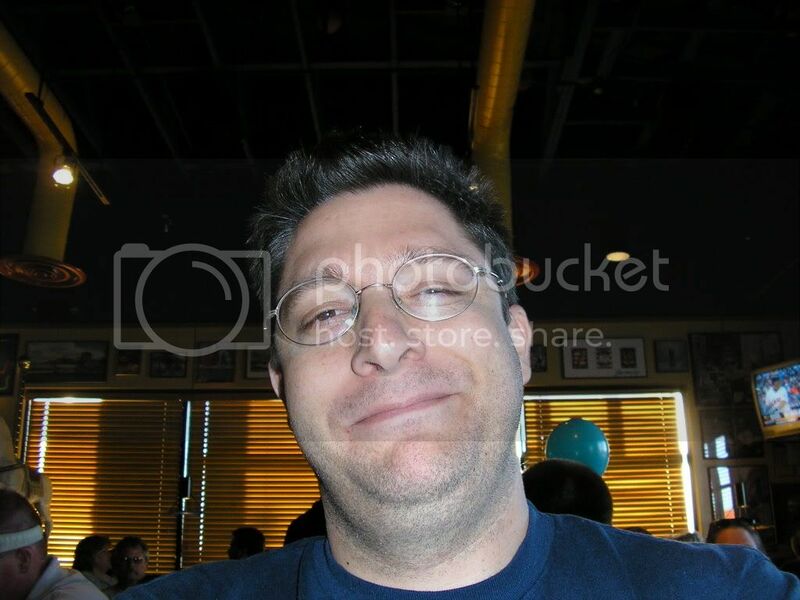 The THW Yahoo group is just as good with plenty of obliging folks. I guess all I can say now is: Go check out THW! 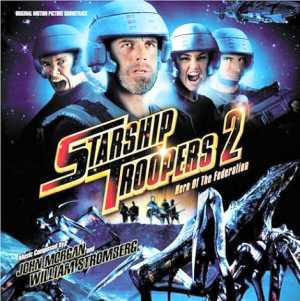 Top: Starship Troopers (SST), the novel. 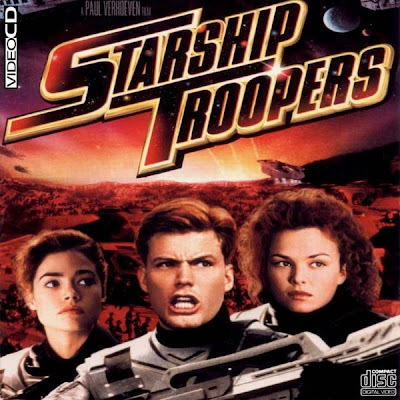 I just finished reading Starship Troopers (SST), the novel and what a great book it is. 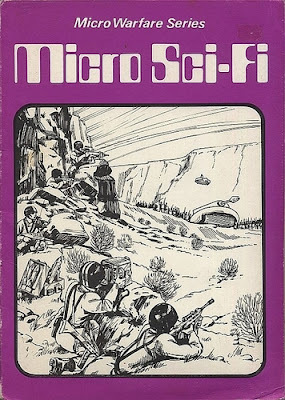 SST was a groundbreaking novel in its time and is arguably the first book to describe many sci-fi memes including power armor and insectile aliens. But beyond the entertaining science fiction story is much of what really earned Robert A. Heinlein his name: a very intriguing discussion of current social conditions and how future societies may deal with them, which is at the heart of sci-fi as literature. It's where Isaac Asimov made much of his name as well. Reading SST, the novel, really can inspire one to consider current questions of nationality, citizenship, civic virtue, education, military organization, and many others. And SST certainly wasn't the first novel in which Heinlein examined American society... many of his other novels question education, social values, and many other cornerstones of societies around the world. In fact, much of the writing reminds me of the philosophical writings of Edmund Burke. - The basis on which a successful State establishes citizenship. - What is civic virtue and how should it be instilled in succeeding generations. - How should successful military leadership function. - What the ratio between teeth (the fighting edge of an army) to tail (logistics) in a successful military should ideally be. - How to inspire the fighting man. - One way how to solve the natural rivalries that often exist between different branches of a military. TOP: The first SST film was relatively well received. TOP: The second SST film was widely panned. SST has spawned two films and a third is coming out. I recommend enjoying the first for entertainment value although with the knowledge that the underpinnings of the novel and film are like night and day. The film is more about fascism and a negative critique of existing democracies at heart with the central message of destroying them while the novel was much more about a critique of Western-style democracy with an idea of reclaiming what is good about democracies. The second film was universally panned and very few have had anything good to say about it. I found it rather mediocre although I enjoyed it with the caveat that I'm a dedicated sci-fi fan. 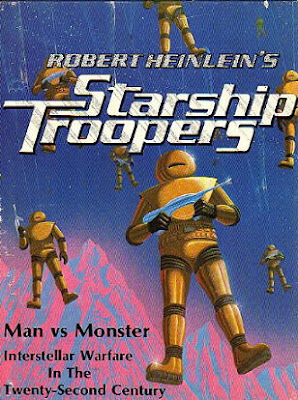 TOP: This SST cartoon series later inspired a miniatures game. 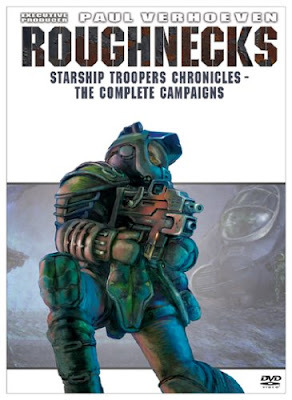 The first SST film inspired the above Roughnecks animated series, which did fairly well and went on to later inspire a miniatures game. The animated series was definitely made with a younger audience in mind and avoids blood, gore, and death, which more or less emasculates the novel. While the computer animation is stunning, don't expect much from the storyline. And if you decide you want to buy a copy of the series, go for the multi-DVD compilation set rather than trying to collect each plot arc individually. TOP: The original 1976 SST wargame was and is quite popular. 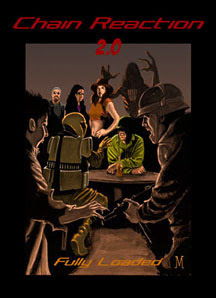 TOP: The 2005 Mongoose Publishing SST game never picked up in my area. The classic Avalon Hills 1976 SST game is a classic and still fun to play. It can be picked up relatively cheaply on the secondary market although I've seeen it fetch relatively high prices on the secondary market. The newer 2005 28mm SST minis game from Mongoose Publishing never really picked up in my area and the latest 2007 SST Evolution game hasn't either. I've played both games and had a small part in playtesting the Evolution rule set and I like them, but I prefer sci-fi skirmish gaming above the company / small squad level so apart from enjoying the odd game at gaming conventions, I haven't extensively played the game. There's a relatively small group in the Bay Area that plays it, but I almost never see it local to Sacto anymore. And if you prefer the novel to the film, you're better off with the classic 1976 SST game from Avalon Hills, which IS based on the novel, rather the Mongoose game, which is based on the animated series. I certainly haven't done more than touch upon the many pop culture forms that SST has taken... It's also appeared as a graphic novel, in several Japanese anime series, and elsewhere, but I endeavored in this post to cover a rough selection of what's out there that may be on interest from a gamer's perspective. TOP: One of Edmund's awesome OGRE minis. I may still come out with my own take on reviews & overviews in the near future, but I really appreciate and am impressed by Edmund's work. TOP: Monsterpocalypse, a new game coming out from Privateer Press. Privateer Press Announces Collectible Miniatures Game! Today we are excited to announce our plans to produce a collectible miniatures game (CMG) named Monsterpocalypse™. Monsterpocalypse brings the kaiju (loosely translated from Japanese as ‘giant monster’) genre to the tabletop in the form of a fast-paced, action-packed CMG. 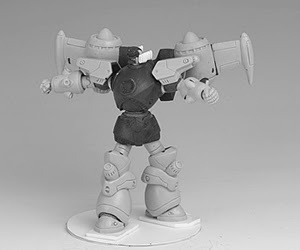 The Monsterpocalypse CMG will launch with over 80 pre-painted plastic figures in the initial set and will include large-scale monsters, destroyable city structures, and vehicles. Planned for release at retail in 2008, figures will be sold in randomized booster packs and non-randomized starter games, and special figures will be available at events throughout 2008. 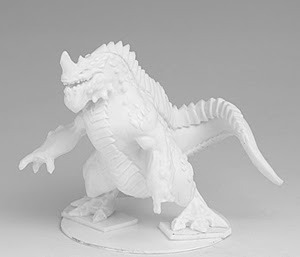 And while I'm not the biggest fan of Collectible Miniature Games (CMGs), I do love Kaiju and for a Kaiju-o-phile, it doesn't get much better than this. 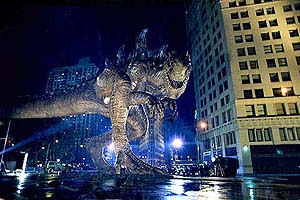 TOP: The 1998 Zilla, an American Godzilla, born & bred to trash NYC. Hmmm... I wonder if they have licensing deal? I'm a bit wary about what PP plans to do with rules... while I like PP's big games War Machine and Hordes, I'm not sure that a similar set would be good for kaiju gaming. However, there's always Monster Island (MI), a set which has already stood the test of time. And speaking of MI, I ran into Patrick Sweeney, the creator of Monster Island, this past weekend and we chatted about what's on the horizon for MI, to which he announced Monster Island II should be coming out next year in 2008 as well. 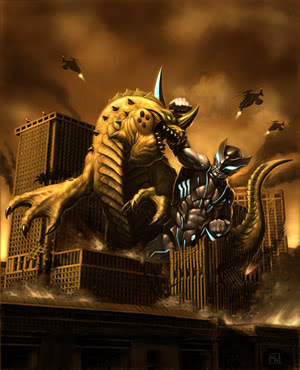 Between MI-II, Monsterpocalypse, and a possible new Giant Monster Rampage (GMR) rule set, 2008 should be a great year for kaiju gaming! I'm really impressed with the prototype sculpts that PP has released to the public... I only hope that the vehicles and buildings scale in around 6mm... Well, here's hoping! 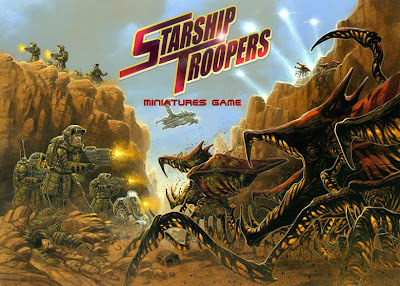 ...pictured with 28mm Starship Troopers minis from Mongoose Publishing. TOP: The Desert Mat System is compact for storage and travel. DCP created resin structures for Ogre in 1992 and 1993. It was a one-man company; modeling, moldmaking, casting, and everything else was done by the incredible Darell Phillips. It eventually became more work than he could handle. The masters and molds now belong to SJ Games, and someday this line may be available again. - Top: Design by Winchell Chung as interpreted by Darell Phillips; sculpting by Darell Phillips. Hardened Command Post (Paneuropean) (DCP-152). - Top: Design and sculpting by Darell Phillips. - Top: Design and sculpting by Darell Phillips. Uses the same base as the jamscreen, but the dish is round and the jamscreen is basically square. - Top: Design by Steve Jackson, sculpting by Darell Phillips. - Top: Design and sculpting by Darell Phillips. Two large and eight small craters. - Top: The same length as the small bridge, but double the width - wide enough for an Ogre. Design and sculpting by Darell Phillips. ...and crossed over into the "supply-side" of the hobby as one of the early sculptors of masters for Star Fleet Battles miniatures. For fans of that game, I made up the Klingon D5, the Neo-Tholians, some of the Andromedans (Conquistador & Python) and Romulans (Skyhawk & Seahawk), Fed Starbase and a few others. 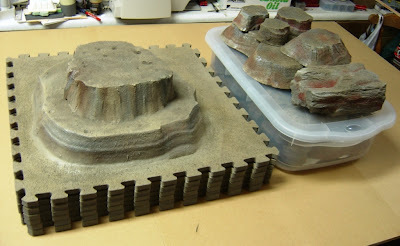 I created Detailed Casting Products in 1987 and offered terrain accessories and 1/285 structures compatible with the Geo-Hex terrain system. I made several 25mm structures, both for fantasy as well as sci-fi gaming. I worked with the old FASA gang a few years later casting up detailed "posing models" of 1/48 Omnimechs, mastered by Sam Lewis. Just for reference, these were not related to the later 1/72 scale Armorcast models, but were intended for photography and promotion of FASA's products. The Battletech Compendium is a prime example, as using computer generated art was too crude then (my, how time flies!). I also worked with Steve Jackson Games on his retooling of the classic games of Ogre and GEV by me offering a line of licensed structures for Ogre. In Steve's award-winning "Ogre Miniatures" rulebook (a real gem), I was given credit within the glorious full-color pages and for making up a special "traditional" hex board in 3D relief. Steve used two of these maps to play his famous "Exercise K" scenario on that he demoed around the globe. TOP: A bird's eye view of some mesas on the Desert Mat System. Suffering a bit of "burn-out" wearing the sculptor hat, production hat, and business hat, I backed out of the industry as a manufacturer and placed the company in "carbon-freeze" as it were. And the good news is that Darryl is back... or almost so. He's been primarily working with 28mm scenery for the moment, but hopes to branch out to other sorts of goodies soon. 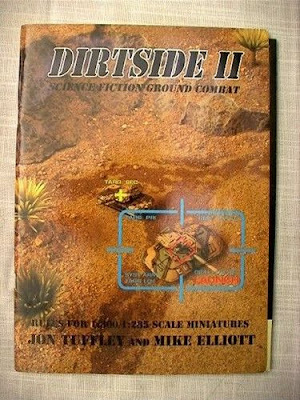 Right now, one of his big projects is a Desert Mat System that is scale-less although Darryl has the prototypes pictured with 28mm Starship Troopers miniatures from Mongoose Publishing. Photos of this Desert Mat System are posted throughout this blog entry and Darryl also shared them over at TMP. TOP: Another view of some mesas on the Desert Mat System. TOP: Yet another view of some mesas on the Desert Mat System. I enjoyed the above film and wanted to share it with my readers. 1. SINCE THE BIRTH OF OUR NATION, OUR LIBERTY HAS BEEN PURCHASED BY VALIANT MEN AND WOMEN OF DEEP CONVICTION, GREAT COURAGE, AND BOLD ACTION; THE COST HAS OFTEN BEEN IN BLOOD AND TREMENDOUS SACRIFICE. AS AMERICAS SENTINELS OF FREEDOM, UNITED STATES MARINES ARE COUNTED AMONG THE FINEST LEGIONS IN THE CHRONICLES OF WAR. SINCE 1775, MARINES HAVE MARCHED BOLDLY TO THE SOUNDS OF THE GUNS AND HAVE FOUGHT FIERCELY AND HONORABLY TO DEFEAT THE SCOURGE OF TYRANNY AND TERROR. WE ARE MARINES - THAT IS WHAT WE DO. 2. IN THE WORDS OF PRESIDENT JOHN F. KENNEDY: “IN THE LONG HISTORY OF THE WORLD, ONLY A FEW GENERATIONS HAVE BEEN GRANTED THE ROLE OF DEFENDING FREEDOM IN ITS HOUR OF MAXIMUM DANGER.” MAGNIFICENT HEROES FOUGHT IN THE WHEAT FIELDS OF BELLEAU WOOD, IN THE SNOWS OF THE CHOSIN, AND ON THE STREETS OF HUE CITY. YOUR GENERATION BEARS THIS OBLIGATION NOW, AND IT IS BORNE ON MIGHTY AND CAPABLE SHOULDERS. JUST LIKE THE MARINES AT BELLEAU WOOD - WE ARE ONCE AGAIN ENGAGED IN SUSTAINED OPERATIONS ASHORE. JUST LIKE AT BELLEAU WOOD - THE MARINES HAVE BEEN GIVEN THE TOUGHEST SECTOR AND HAVE PREVAILED OVER A RESILIENT AND DETERMINED ENEMY - WHO HAS MADE US PAY FOR OUR GAINS. ONCE AGAIN, AS IN ANY STRUGGLE, THE ROAD AHEAD IS FAR FROM CERTAIN, BUT AS MARINES, WE ARE NOT DISSUADED BY THE CHALLENGES OF WAR OR THE TOUGH CONDITIONS OF A WARRIOR’S LIFE. INDEED, WE DON’T JUST ACCEPT OUR DESTINY - WE SHAPE IT. 3. ON OUR 232ND BIRTHDAY, TO EVERY MARINE - THOSE STILL IN UNIFORM AND THOSE WHO HAVE SERVED HONORABLY IN THE PAST - BE PROUD OF WHO YOU ARE AND WHAT YOU DO. KNOW THAT YOUR CITIZENSHIP DUES HAVE BEEN PAID IN FULL; YOU ARE PART OF THIS NATION’S ELITE WARRIOR CLASS. CHERISH OUR FAMILIES WHO OFFER MARVELOUS SUPPORT, ABIDING RESOLVE, AND STEADFAST PATIENCE. REMEMBER THOSE WHO HAVE SERVED AND THOSE WHO HAVE FALLEN - THEIR NAMES ARE CHISELED ON THE ROLL CALL OF AMERICA’S HEROES. THOSE WHO HAVE CARRIED THE BATTLE COLORS OF OUR CORPS HAVE FORGED OUR HERITAGE, AND TODAY’S GENERATION OF LEATHERNECKS CHART OUR FUTURE. CARRY THE COLORS WITH PRIDE; CARRY THEM WITH HONOR. TOP: Happy 232nd birthday, USMC! Please donate to the Project Valour-IT Veterans Day Fundraiser, to provide voice-activated laptop computers to injured and disabled veterans if you get a chance to... as well. It's a small way for us to give back to men whose contributions to our society are easy to take for granted. As a veteran myself, although of the United States Air Force (USAF) and not the Marines, and coming from a family with a long, proud service record, I'm always happy to celebrate Veteran's Day with my American friends and Remembrance Day with my Canadian, Ozzie, and British friends. I also want to send out a special thanks to my father and grandfathers who served across the world to preserve some of the many freedoms I enjoy today whether in Cuba, Brazil, Europe, Japan, Korea, Vietnam, or elsewhere. HOLIDAYS: "Happy 232nd birthday, USMC!"
. 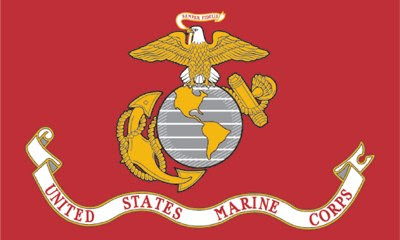 TOP: The flag of the USMC. Happy 232nd birthday to the United States Marine Corps! As a veteran myself and coming from a family with a long, proud service record, I'm always happy to celebrate Veteran's Day with my American friends and Remembrance Day with my Canadian, Ozzie, and British friends. TOP: "Is there a new dress code at work?" This week has been tough for me... we got a new Grand Poobah at work and I still haven't figured out how to gleam something positive from the experience. In fact, I'm downright frustrated. Well... noone said life would be easy. AT WORK: You have to share the toilet with some people who pee on the seat. Many thanks to my friend Cheri for sending it to me! I hope that your work days, reader, are going better than mine lately! TOP: "At your leisure, my Lord"
Thanks for the cool graphic, Miranda! Cylon Centurion: Our Raiders are all destroyed. Imperious Leader,: All destroyed? How? We took them by surprise. 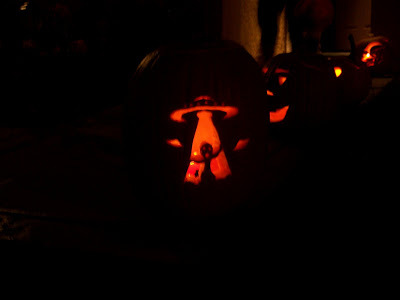 Cylon Centurion,: Apparently it was not as big a surprise as we had hoped for. TOP: The Last Starfighter movie poster from 1984! 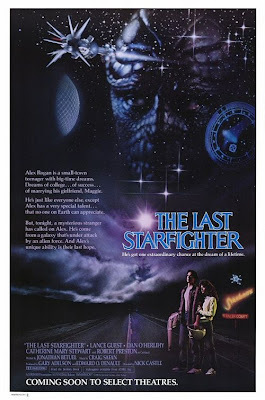 Way back in 1984, one of my favorite sci-fi movies ever debutted, The Last Starfighter, a fun little romp of a film that helped to pioneer the use of CG (computer generated) special effects. One of most entertaining details of the movie back in the 1980s was the use of a video arcade game unit in the film as a recruiting tool to find star pilots for a fantastic galactic force of Gunstar starfighters to defend the universe against bad guys everywhere. The idea was that if you could beat the video game, you'd make a good starfighter pilot since you'd have the right eye-hand coordination, reflexes, and all that. It worked in the movie at any rate and after the film came out, young people everywhere scanned video game arcades everywhere for Last Starfighter units hoping to enlist in the galactic force, but... a video game of the movie was never made... until now! As we discussed at length in DTA Podcast #1, we all ran out of the theater after seeing The Last Starfighter hoping to find a Starfighter game in the arcade — so we could blow our little hometowns home planet forever. Well, now you can have a Starfighter game of your very own — but you’ll have to build it yourself. Here’s the skinny: the great folks at Rogue Synapse — a resource for movie-aficionados and game cabinet builders — have not only researched the details of the game cabinet from the movie, they’ve also developed a working version of the Starfighter game. This is the game that should’ve hit arcades right after the movie but never did. And it’s a free download! So, alright already, let's go out and blow up the Ko-Dan Armada! 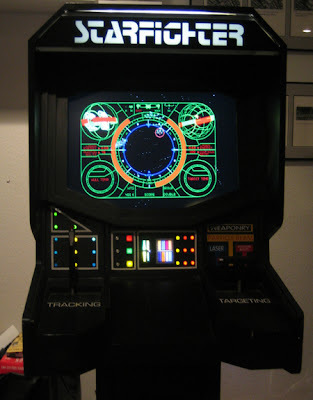 TOP: A REAL The Last Starfighter video game unit. And if you've never seen the film, go out and rent it soon. It's a family-friendly film and just good, clean fun. I'm including two links about the film below if you'd like to learn more about it. 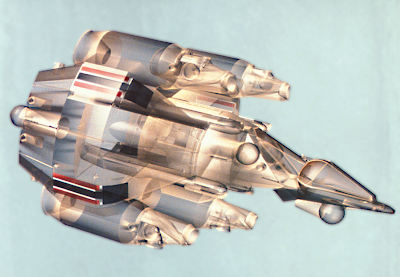 TOP: The awesome CG Gunstar space fighter from The Last Starfighter. Mini Model Madness has all sorts of fun resin replicas of movie vehicles. I've seen games use MMM models before for miniatures wargaming... They're a bit pricey but they paint up nicely. TOP: It has that awesome B&W feel, only it's in 28mm Pulp Nils-O-Vision! It was just a month or so ago that I attended ConQuest San Francisco 2007 and this year was a breakthrough for me in finally seeing the incredible value one can get with paper scenery. My buddy Nils ran an awesome set of three linked 28mm pulp games and the paper scenery he used was nothing short of amazing. I had helped him playtest some of the games early on... before he assembled his paper scenery. My last major experience with paper scenery was the paper castle that came in a Dragon Magazine back in the 1980s... and what a change has come over paper scenery since then. 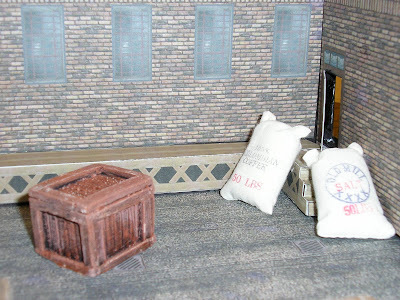 Nils has all sorts of awesome paper scenery goodies: a loading dock, a mad scientist's headquarters complete with a giant ray gun and much more! My other semi-recent experience with paper scenery came from a buddy who has since moved back East and has played with making paper models. 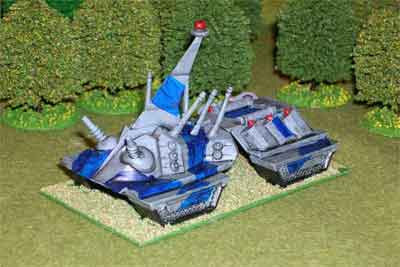 I'm including one of Chuck's links below so you can check out the awesome Eldar grav tank he designed. 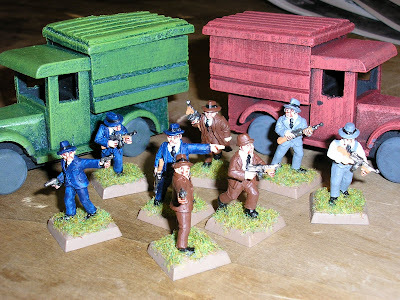 TOP: 28mm pulp G-men with wooden Walmart trucks! Nils is a master of cheap materials... his wooden trucks came from Walmart and he often posts at TMP under his stage name of Black Cavalier. A coat or so of paint and the Walmart trucks went from OK to looking pretty snazzy. Nils does wonders with his minis. And his experimentation with paper scenery prompted me to see what's out here. 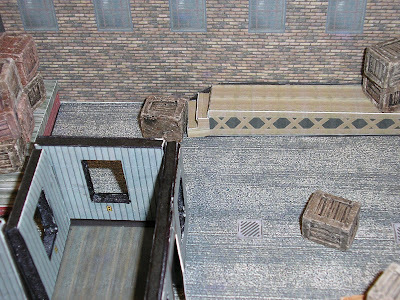 I'm including a link below to a great round-up article on 28mm paper scenery manufacturers. TOP: Awesome paper scenery with accessories! TOP: Awesome 28mm paper scenery. 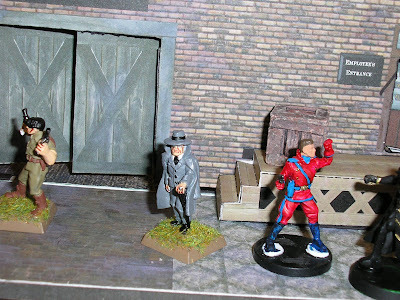 When I eventually work up some 28mm modern zombies, I think I'm going to go with paper scenery despite having witnessed the awesome 3D splendor of the Zombie Town games. 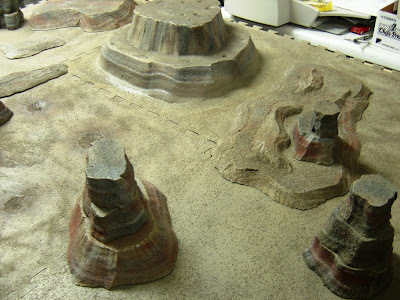 It's a heck of a lot less expensive to go with paper scenery and even when you consider assembly time, it's easier to print, cut, and glue paper models than having to do the same with non-paper miniatures scenery made of resin, plastic, or other materials which require cleaning, preparation, assembly, and painting. Being able to skip the painting step really saves on time. 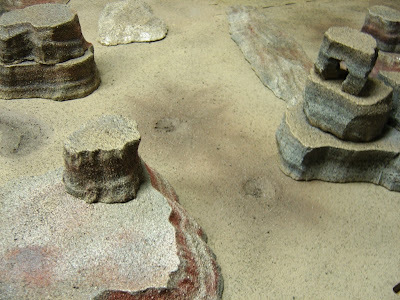 At any rate, I was very impressed with the 28mm pulp paper scenery I saw at ConQuest San Francisco 2007! 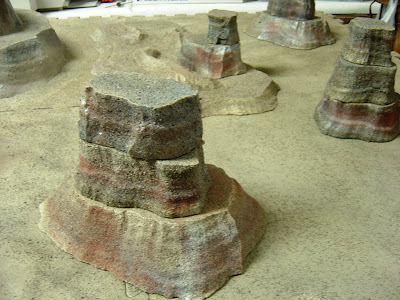 Nils wrote in to make sure that the manufacturer of the terrain he used gets proper credit. Nils used paper terrain from the The Mean Sets made by The Virtual Armchair General. Thanks, Nils! 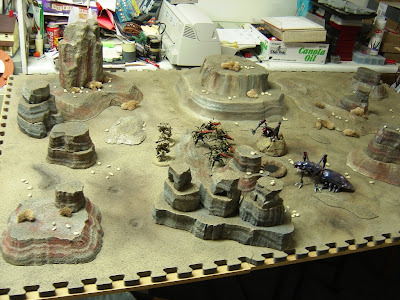 Nils updated his blog with a snazzy battle report and better photos of the game.